In international business literature several researchers have applied the microeconomic concepts scope and scale economy in the context of foreign market servicing modes. 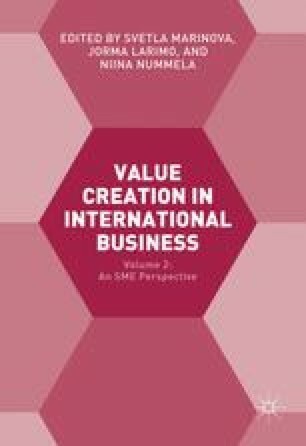 Researchers discussing the optimal timing of Foreign Direct Investments have shown that in terms of total costs, it is favorable first to export to the foreign market via a local sales agency or a distributor due to scope economies and later on to switch to a production subsidiary due to scale economies. Export channel volume is therefore conceptualized as one of the determinants of entry mode choice. This chapter focuses differently by taking a network approach to internationalization. Setting of from the triadic entry nodes concept we highlight the value offered to small firms in the internationalization process by intermediaries operating as network informants, integrators and coordinators. Moreover, we challenge the viewpoint that foreign market entry is a mona dic relationship between one producer and one foreign party.